Located in the ranching and mining town of Challis in Idaho, the Watermark Inn is an elegant bed and breakfast retreat that provides a tranquil and secluded wilderness getaway. 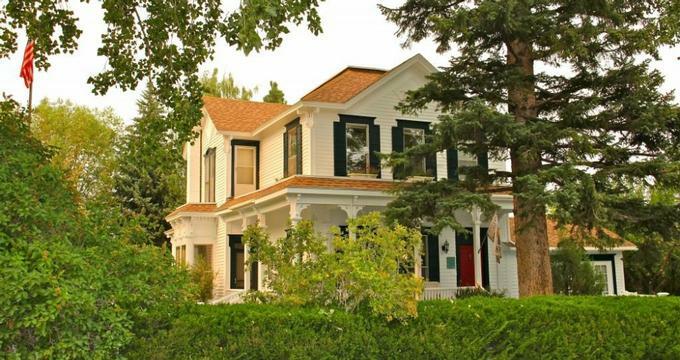 Surrounded by the magnificent landscapes of Idaho's Round Valley, the Inn is set in a beautifully maintained four bedroom Victorian-Italianate home. Built in 1896 and listed on the National Historic Registry, the historic Inn features stylishly appointed and individually decorated guest rooms with contemporary, yet rustic décor and furnishings, en-suite bathrooms with shower/bath combinations, and large windows boasting breathtaking views. Amenities at the Watermark Inn include a delicious gourmet breakfast every morning and dinner by arrangement, lovely gardens and grounds in which to relax and a variety of outdoor activities and pursuits such as fishing in the Salmon River, horseback riding, hiking, mountain biking, kayaking or exploring the Frank Church-River of No Return Wilderness. The Watermark Inn features four beautifully appointed and individually decorated guest rooms with contemporary, yet rustic décor and furnishings and large windows boasting breathtaking views. All accommodations have king or queen-size beds with pillow-top mattresses, high-quality sheets and linens, plush pillows and thick comforters, and en-suite bathrooms with bath/shower combinations, fresh towels, and organic bath products. East Fork has a private entrance and features a queen-size bed with pillow-top mattress, high-quality sheets and linens, plush pillows and thick comforters, and an en-suite bathroom with a shower/bath combination, fresh towels, and branded bath products. Located on the upper level of the Inn with south-facing views, Yankee Fork has a plush carpeted floor and offers a queen-size bed with pillow-top mattress, high-quality sheets and linens, plush pillows and thick comforters, and an en-suite bathroom with a shower/bath combination, fresh towels, and branded bath products. North Fork is a masculine room decorated in dark hues of navy blue and features a queen-size bed with pillow-top mattress, high-quality sheets and linens, plush pillows and comforters, and an en-suite bathroom with a shower/bath combination, fresh towels, and branded bath products. This room adjoins the Middle Fork room and boasts large windows with views of the Garden Creek. Middle Fork has two twin beds with pillow-top mattress, high-quality sheets and linens, plush pillows and comforters, and an en-suite bathroom with a shower/bath combination, fresh towels, and branded bath products. This room is joined to the North Fork Room and can be taken together to create a family suite. A complimentary breakfast is served every morning and includes coffee, tea and hot beverages, fresh fruit and juices, cereals, granolas and yogurts, egg dishes, and freshly baked pastries, and bread. Hot drinks such as coffee and tea are available throughout the day. Dinner is available by reservation only. Amenities at the Watermark Inn include a complimentary gourmet breakfast every morning, beautiful gardens in which to relax, and a variety of activities, such as hiking, mountain biking, horseback riding, fishing in the Salmon River, kayaking, canoeing, and more. The town of Challis in Idaho is rich in history and heritage and has many attractions to enjoy, ranging from the Custer Motorway and the Salmon River Scenic Byway to a range of outdoor activities and pursuits. Attractions include the Land of the Yankee Fork State Park, the Salmon-Challis National Park, the Sawtooth National Forest, Centennial Park, the Salmon River (The River of No Return), and ghost towns such as Bonanza, Custer, and Bayhorse. Sporting activities and recreational pursuits include fishing, swimming, kayaking, canoeing, hiking, mountain biking, climbing, horseback riding, bird, and wildlife-watching.